Suraj Patil one of the famous name in leather cricket and Tennis cricket world who started his career as a fielder and later became successful all rounder. Most players start their career as a specialist bowler and then becomes batsman. Something like this happened with Suraj. Suraj was first noticed by his school management for this best fielding when he was in 5th standard. When given chance to bowl by his captain, he did what he meant for. He took 4 wickets and never turned back in his career. After that He fixed his spot in team as a bowler and last batsman. During a practice match he smashed 54 runs as a tail ender and gained trust as a batsman for his skipper. And guess what, he was picked as an opener during inter school tournament for his team. With his all round performance he was selected for Raigad District U19 team. During Raigad District open team selection, Suraj scored 7 fifties off 9 games and took 21 wickets. After this power pack performance, he represents Raigad team for 6 times. He lead his team 2 times during Super League tournament. Suraj again shines when he shamshed 3 hundreds and 4 fifties during Ranji Trophy selection. Also he picked for West Maharashtra team. Unfortunately he could not participated due his engineering exam. In Times Shield trophy, playing for Cub XI, Suraj have 40 fifties and 2 hundreds on his name at club level matches. Due to which he picked for Mumbai University team in 2000. It was in 2000-01, when he was playing tennis cricket from Raigad’s famous team Siddhivinayak Kolgaon (Most of the famous players from Raigad and Mumbai have represents this team) bowled a maiden over when opposition required 1 run in that over. And since then, his magic in tennis cricket started. Alibaug’s famous team Cocktail also played him for his magic. Like leather cricket, he shines in Tennis cricket and now he is famous with well known “Alibaug Express”. Suraj has played from various teams in Alibaug. Currently he is playing from Kuber Xi, Alibaug and Royal Kalmboli open team. He holds to take 8 wickets in 8 consecutive balls this year. Also he smashed 54 runs off just 11 balls against Sasvane. Till date Suraj has successfully defended 1 run from last over four times. Also he won al four individual prices Man of the Match, Man of the Series, Best Bowler and Best Batsman four times. Also he has more than 510 trophies. His school coach Shyam Kule played important role in his cricketing career. Suraj started his career as a fielder and excellently achieved success in both leather cricket and tennis cricket. He has more than 510 trophies. Suraj have 40 fifties and 2 hundreds on his name. 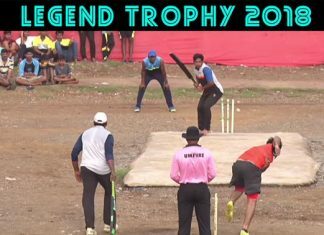 In 2000-01, when Suraj was playing tennis cricket from Raigad’s famous team Siddhivinayak Kolgaon (Most of the famous players from Raigad and Mumbai have represents this team) bowled a maiden over when opposition required 1 run in that over.